EN Enclosures are designed with built-in features to manage high-density cable management applications of switches and servers. Knockouts and openings for top and bottom cable access. Repositionable finger sections along each rails. Features open side area to accommodate large bundles within and between ganged enclosures. The EN ships completely assembled and is ready for immediate use! Rails: (2) pairs of tapped #10-32 mounting rails with cable management "fingers"
Designed with a Flexible Mounting Profile (FMP), a series of holes along each rail that falls outside of the mounting profile; allows mounting of power strips, cable management, patch panels, etc. Great Lakes Baffle Kits create proper airflow for switches, and side-to-side airflow equipment, as suggested by manufactures such as Cisco Nexus or Catalyst Switches. Cool air is channeled into the equipment along the right side and exhaust air is directed out along the left side. Kits are tool-less and easily attach to rails outside of EIA mounting profile. EN Enclosures are designed so that the front doors open to the left or right. When two enclosures are ganged together, doors can open in opposite directions, creating a large space where cables are easily accessible and able to be routed up, down, or to the next enclosure. Split doors require a smaller swing clearance, allowing enclosure aisles to be placed closer together. A pair of locking, lift off, solid side panels for 48"D x 91"H (48U) Great Lakes EN-Series server rack enclosures. 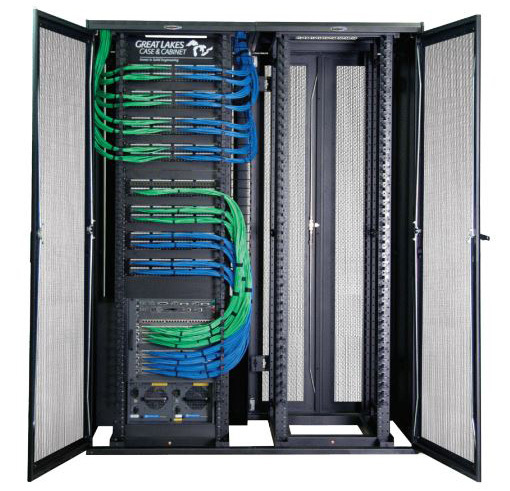 Horizontal Cable Manager allows cables to be safely routed from the front to the rear of 42"D Great Lakes Enhanced Networking Enclosures. Single Fixed Height Cable Ladder Bracket (3") with hardware; supports 12"W overhead cable management ladders. Single Fixed Height Cable Ladder Bracket (3") with hardware; supports 12"W, 18"W, & 24"W overhead cable management ladders. Prevent hot air (from the rear of servers) from recirculating to the front of servers. Tool-less Networking/Ganging Kit to gang two Great Lakes EN Enclosures together. Isolated Grounding Copper Bus Bar for 91"H enclosures. Protect users and equipment from dangerous voltage, and limit static electricity within the rack. GR101 is a electrical rack grounding kit consisting of one 46"L ground wire assembly, five 24"L ground wire assemblies, and hardware. A set of four casters assemblies, non-locking; for the Great Lakes EN Enclosures. 8 Watt fluorescent light with on/off switch. Can be installed in front or rear of cabinet along the bottom, top or side of the cabinet. 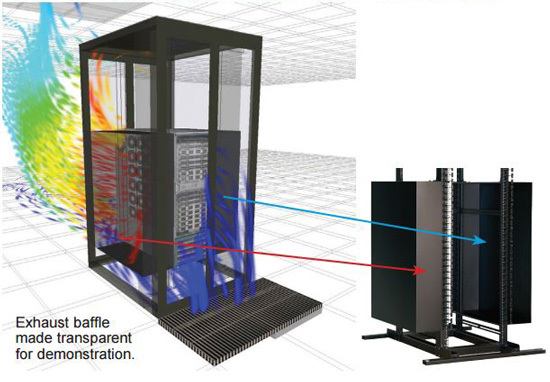 Blanking Panels are used for proper airflow management within a rack - Reduce hotspots and bypass airflow. Patch panels are panels of network ports which connect incoming and outgoing lines of a LAN or other communication, electronic or electrical system. Eliminate accidental and vibration power cable disconnects - zLock is the only universal locking power cord that locks both ends. Power Cords & Extension Cords available in a huge variety of connectors and cord lengths! Automatically switch power inputs if either in-feed goes down - Fail-Safe N+1 Power Redundancy. Remote Monitor various types of camera and sensor devices, such as temperature, humidity, water, smoke, motion and door sensors. See full selection of overhead Cable Runways - Ladders & Ladder Accessories, Bends & Radii, Junctions & Splicing, Supports & Mounting brackets.